For more, head to Efteling UK on Facebook! 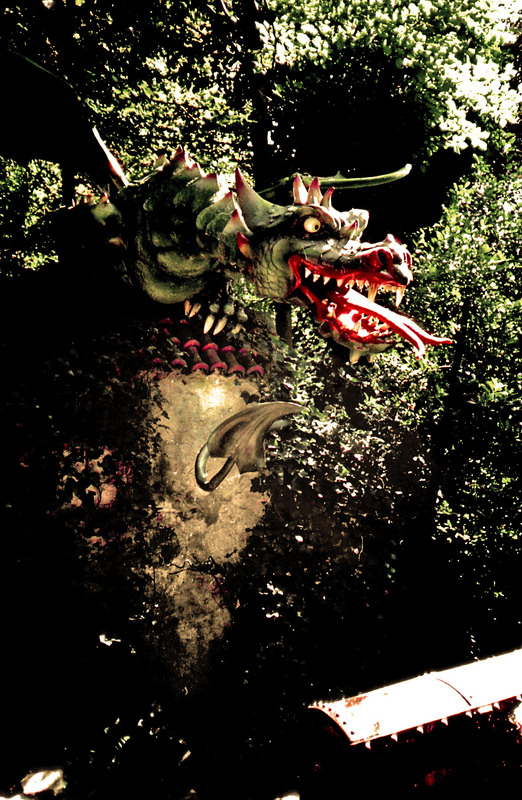 George and the Dragon (Joris en de Draak) opened on July 1st 2010 in Efteling. Located across the water from The Flying Dutchman in the Adventure Realm, on the site where the wooden roller coaster Pegasus could be found previously. Efteling have, on many occasions, stated that they do not like to throw anything away or tear anything down, however they took the hard decision to let Pegasus go after 18 years of loyal service due to the ride becoming uncomfortable and outdated. Not wishing to lose their traditional wooden coaster entirely, they choose to build a new one in its place, not just one, but a double coaster; a racer! Efteling do not do things by halves, and so they brought in the best people in the business of wooden roller coasters, Great Coasters International. GCI have built coasters for numerous theme parks all over the globe, including Dollywood, Busch Gardens, Hersheypark, and Six Flags. In 2009, the deal with GCI was signed, and work could begin on the new coaster. Firstly of course, Pegasus had to be torn down, and this sad event took place in June 2009. 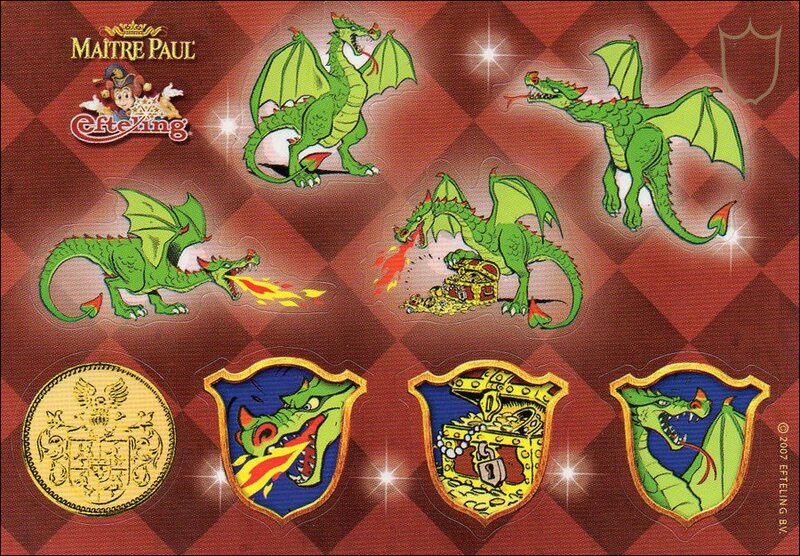 Instead of the wood from Pegasus going away to recycling, Efteling gave visitors the chance to own a part of this much-loved attraction by cutting the wood up into small blocks and stamping the Pegasus logo onto it. These blocks were sold in souvenir shops in the park and weren’t available for long due to their popularity! 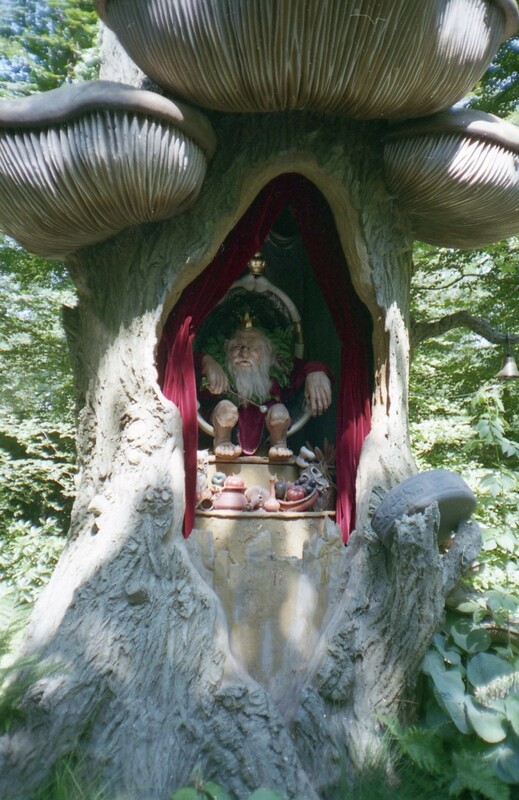 Of course any respected ride in a theme park, Efteling in particular, has to have good theming and a story to carry it. 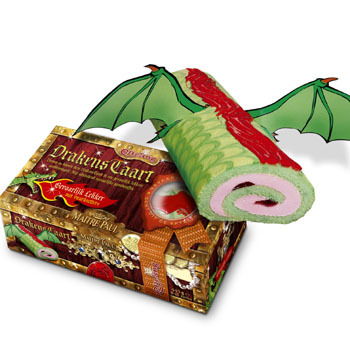 The story of George and the Dragon was chosen to accompany the ride, and it is the rider’s duty to slay the dragon. And what a dragon it is! 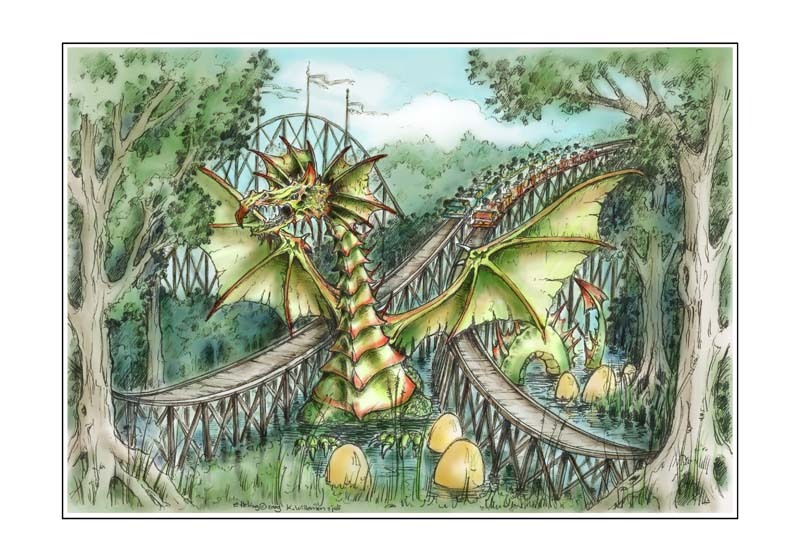 In the concept art (top of the page), the dragon looked very big compared to the coasters, and although he isn’t quite that big, he is a very large creature. He (I shall presume it is a he) reaches 10 metres tall (34ft), with huge sharp teeth and lethal claws, and let’s not forget his fire-breathing habits! 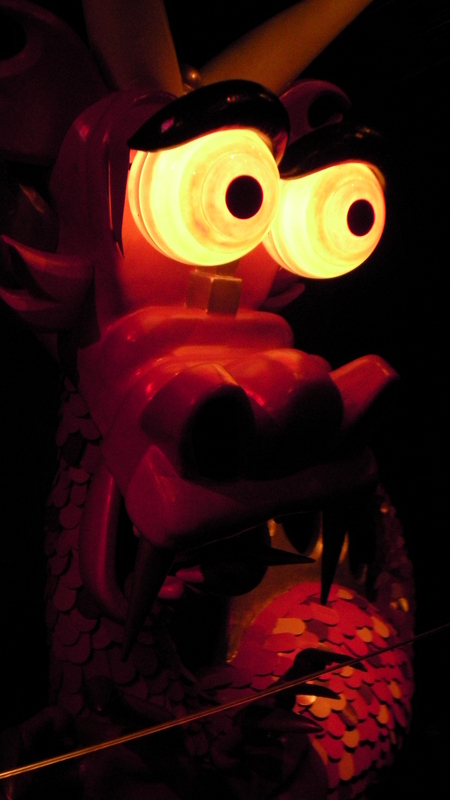 Fire and wooden coasters do not exactly go hand in hand, but the folks at Efteling and GCI have made sure that the dragon points his head upwards when he breathes his flames! With Pegasus out of the way, GCI could begin construction on George and the Dragon. The plan was to have two trains racing against each other to the finish line, based on the elements of fire and water (a blue coaster and a red coaster). In November 2009, GCI started to lay the foundations for the coaster. This was followed by a blanket of snow in December, which caused the work on the foundations to grind to a halt. By January 2010, the snow had still not budged, and Efteling started to grow concerned as they wanted the ride to be ready for July 1st. Wanting to move construction ahead as swiftly as possible, a 40 metre long tent was erected on the site, containing a large heater which would be left running for a few days. The heat would allow the steel bars and the concrete to thaw out, and prevent any moisture in the concrete from freezing over. In February of 2010, the coaster’s construction reached its highest point at 82ft, and the Efteling flags were flown from the top of the structure. By April, the station was starting to take shape, with the props added, the lift hill chain being tested, and the cars arriving from America. With one month to go until opening, theming and landscaping began around the coaster. Where the dragon would be located, dark trees and black plants were planted to give the effect of them being scorched by his fire. Finishing touches were added to the queue, (including a very fancy vending machine) which is made to look like the swamp where the dragon resides. Each of the 4 trains on the coaster has 12 cars seating 2 people per car. These trains are called Millennium Flyers, known for their flared sides, cushioned seats and individual lap bars, as well as the name of the ride displayed on the front car. The cars are constructed at GCI headquarters in Pennsylvania, where they are inspected and tested. The wood used on the coaster is Yellow Pine wood from Canada, which is a strong, long grain wood that is perfect for building roller coasters. All the wood was brought along with Great Coasters International, and it was all cut on site, unlike many coasters which have their parts shipped in already made, IKEA style. There are eight layers of wood making up the structure of the coaster, with the top two accommodating the trains. With opening day fast approaching, many more tests were carried out on the coaster, running the trains around with ‘water babies’ inside to simulate passengers. 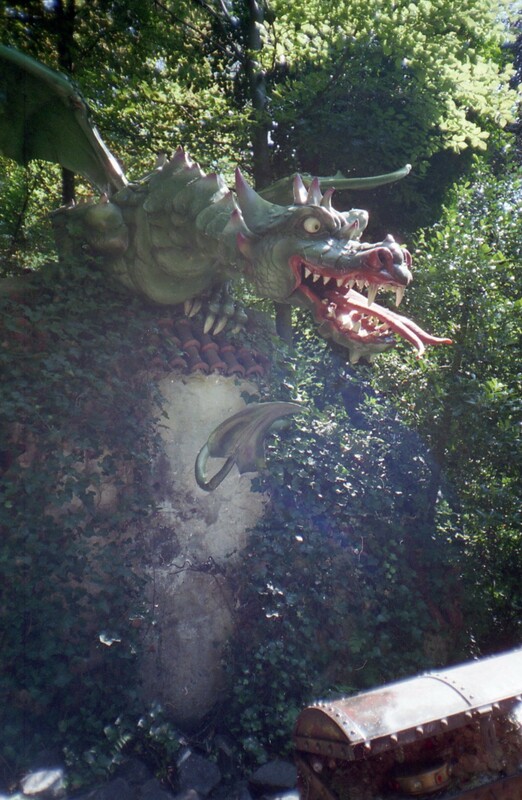 The long-awaited dragon was then added to the swamp, completing the theming. After all tests had been carried out, it was time for the launch party for the press, which took place in the Station de Oost. Here, the guests were split into two groups: fire and water, and then they boarded George and the Dragon for the ride’s first race between guests (even the King and George were present!). 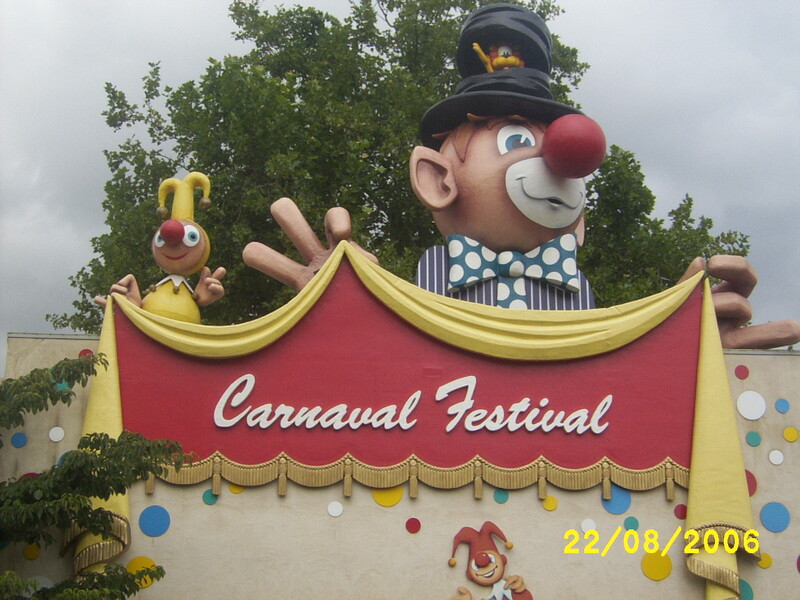 Finally, the ride was opened to guests on July 1st 2010, after months of hard work. 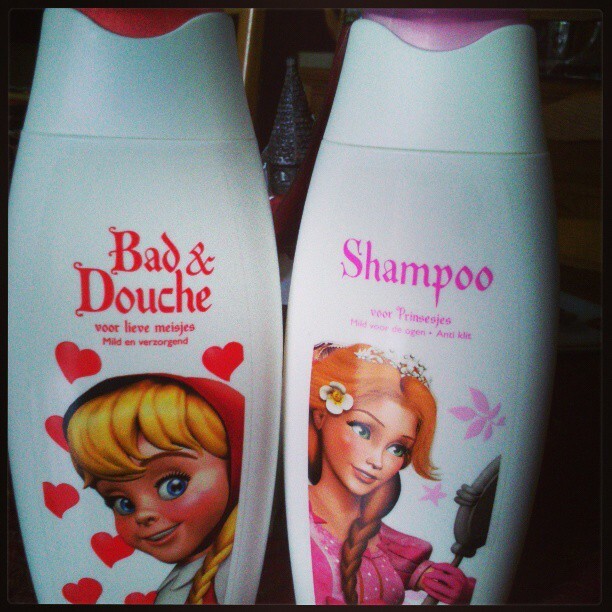 The result is fabulous! 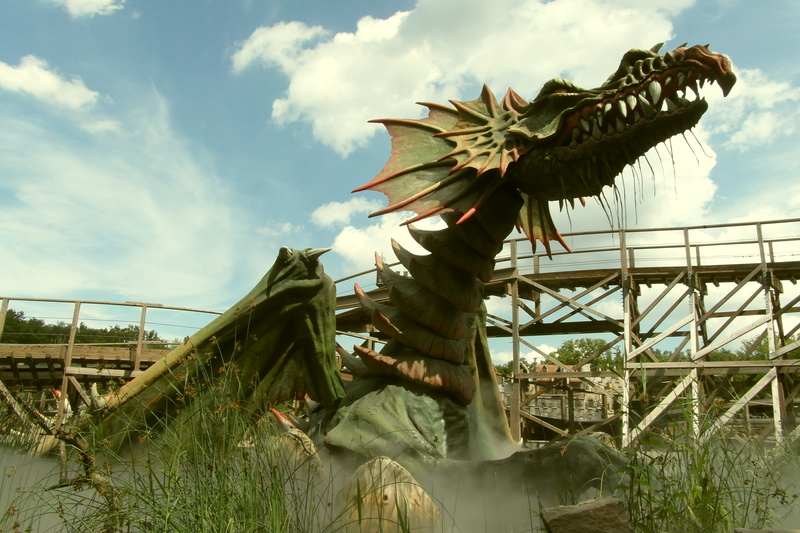 As you enter, you queue through the dragon’s swamp and then have to decide which side you will choose to ride, fire or water. The queues then split, and are identical on each side apart from one side is decorated with blue flags, and the other red flags. 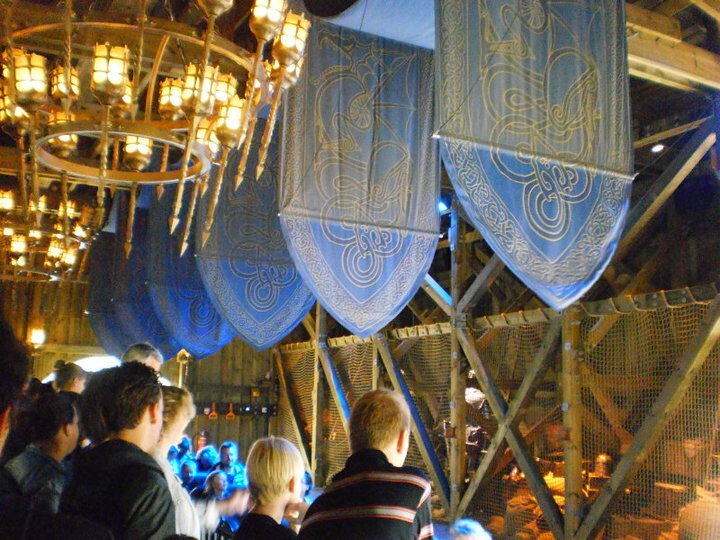 The boarding area is themed to give the impression that you are in an armoury, choosing which weapons you will use to slay the dragon right before you embark on your journey. Apparently you know that a ride is going to be good if you get strapped in twice, and guess what…that’s right, a seat belt as well as a lap bar! The ride gets up to speeds of 46.6mph, swerving round corners and soaring up and down hills in a spectacularly smooth style compared to the ride it replaced. 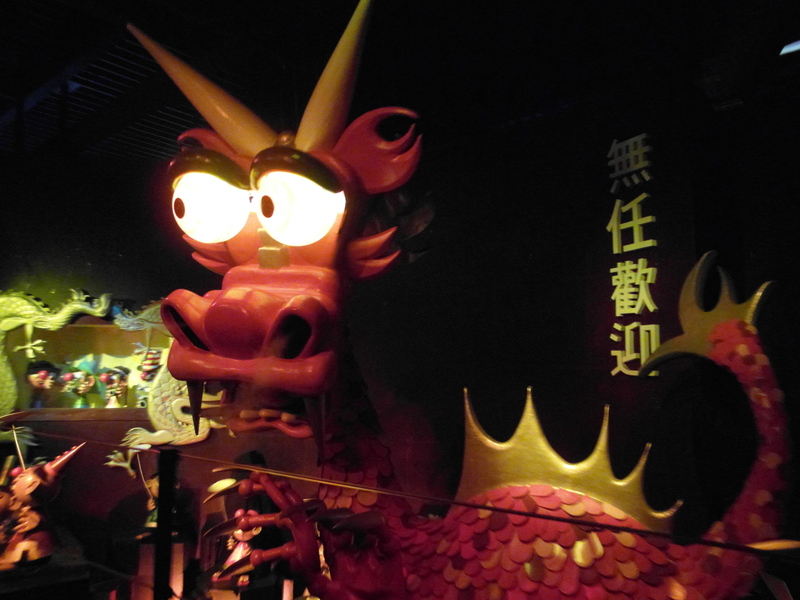 You fly past the 10 metre tall dragon whilst he glares at you and makes a fuss, but no worries; you’re gone before he can bend his head down for a second look! At the end of the race, the winners are proclaimed by a flag on their side of the track, and when you arrive back at the station, you are greeted with a drop of the flags and a lot of cheering! If you lose, sadly you are welcomed back by boos! The music is uplifting with a sense of adventure, and is composed by René Merkelbach, who also created the music for The Flying Dutchman and Cinderella. The 600 cubic metres of wood used on the ride is held together by a colossal 90,000 bolts and 162,000 nails. Each track is 810 metres long, making the ride 2 minutes long and delighting 1700-1750 guests per hour. The cost for this unique ride was 13 million Euros, and is the first wooden racer in Northwest Europe.